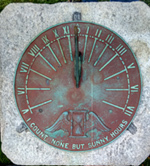 This historic brass dial is about 18 inches in diameter, set upon a square, concrete pillar. The dial plate has Roman numbers and is delineated in quarter hours. Magnetic variation is engraved at degree intervals. The dial originally had a removable wood cover, then a metal one, which became permanently closed. It was removed in 2009 and now has a plexiglass cover. 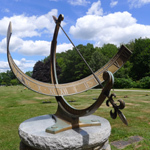 From Betty Adams in the Kennebec Journal, "At the uncovering, a half dozen people strained to read some of the lettering on the dial: 'Arc for magnetic variation', [and on an interior circle] 'Moses B. Bliss - Circumferentor' which means surveyor's compass... 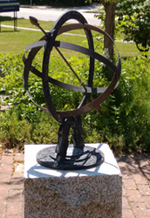 The meridian monument was one of those erected at county courthouses in Maine between 1869 and 1871, according to research by Harold E. Nelson, senior geodesist at the Maine Department of Transportation's property office...Nelson said the monument would have been used by local land surveyors to test their compasses against true north." A set of three declining vertical dials each approximately 3x4 foot of carved Indiana Limestone set into the east, south and west facades of Hubbard Hall. Dial faces include hour lines and Arabic hour numerals. Each bronze gnomon rod is additionally supported at its end. The dials are not corrected for longitude and there is no EOT correction provided. With corrections, all three dials tell accurate time. The building south wall declines approximately 18? west of south. A small horizontal dial with an interesting history. In 1997 when the dial was installed, the following is quoted of designer and builder Jim Estey: "We set it by our watches," Jim said, and then glued it down to its stand. That means it cannot be reset when the sun and time changes, but visitors will have to compensate."